For all your metalcore fans out there, we’re proud to bring you our latest in metalcore merchandise – it’s our 100% official Motionless In White merch including t shirts, vests, hoodies and other accessories too. Any fan of this Pennsylvanian faced rock band formed in 2005 will want to get their hands on some of this unique band clothing and gifts – and we’re happy to oblige with our MIW merch range. 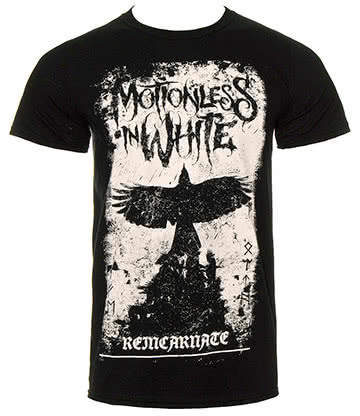 The name of the band that has inspired this Motionless In White merch was taken from the Eighteen Visions song ‘Motionless and White’, and the band are well known for their horror and darkness themed lyrics as well as their particularly heavy doom sound. MIW on stage have a very energetic presence as well as a look inspired by the gothic subculture. The band’s first album, entitled Creatures, was released back in 2010 and reached number 175 on the Billboard 200, while their follow up album called Infamous reached number 353 in the same chart, as well as number 4 on the top hard rock album chart too. The band's third album, Reincarnate, brought the group even more fame and infamy. This recognition led to a huge increase in the Motionless In White merch demand, and we’re happy to be able to provide you with all of the potential MIW merchandise you’re looking for, including t shirts, hoodies and even accessories such as wristbands. Whether you are a fan of the band yourself or are looking for a gift for someone who is, you can be sure that you’ve found exactly what you need in our Motionless In White merch collection at Blue Banana. With the best 100% official band merchandise that you’ll find anywhere, as well as stunningly low prices and fast delivery, you don’t need to look anywhere else for your newest Motionless In White clothing or accessories and gifts. Even if you’re only just beginning to hear the awesome metal sounds of MIW, you’d be crazy not to invest in some of this affordable Motionless In White merch now before it’s too late. Our stock is always limited as we look to continually update our collections to the newest trends, so if you like a design make sure you grab it now to avoid disappointment later!